The town began as a stop on the Chicago, Rock Island and Mexico Railway in 1901. Someone must've thought the state line was an appropriate place for a depot. Platted in 1906, it had 300 people by 1910 with a school, bank, and a grain elevator. A post office (Texas side) was only open for a four month period 1909-1910. 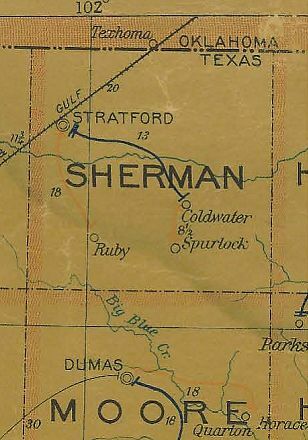 In 1932 the state line was resurveyed to run 465 feet south of what had been the State Line Road. This "relocated" most of the town's businesses to the Oklahoma side.